I’m sorry I haven’t posted anything for such a long time, but I never get any comments or responses so I got to feeling like it was a one-sided conversation and why was I bothering to do it. My sources for free passes pretty much just dried up, so I haven’t been able to attend very many advance screenings also. I’ve seen several movies over the fall, winter, and into the spring including the horrendous “Batman vs. Superman” fiasco, the recent “Civil War” by Marvel (which I felt was much better done), “Criminal” with Kevin Costner, “Deadpool” (which was great although not your typical superhero movie), “Jungle Book” (which was an EXCELLENT re-imagining of the classic Disney movie! ), “Gods of Egypt” (which I really enjoyed, but didn’t do so well at the box office, I felt due to poor marketing! ), “Hateful Eight” (an amazing theatrical experience if you saw it in one of the special 70mm theaters complete with programs and overture as well as intermission! ), “Love the Coopers” (the feel good Christmas movie of the year), “The Martian”, “Stonewall”, and that brings us back to “The Intern” which was my last review I posted before I got bored with it. 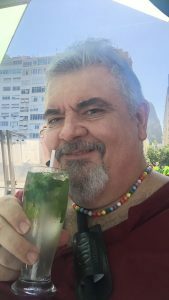 Enjoying a Mojito on Copacabana Beach in Rio de Janeiro! I did go to BRAZIL to Rio de Janeiro in February for Carnival, or as we call it, Mardi Gras! Had a wonderful time! So anyway, that’s a little bit of an update, if anyone is still paying attention. With no comments or feedback, it’s difficult to tell! If you are still interested, let me know! I’m scheduled to go see “VICEROY HOUSE” this week.